Words of Advice from a Liar to a Thief - Charley Brady - Opinons; My Own. I experienced a moment of vertigo as I felt the earth shift beneath my feet last week. I had the same feeling on December the 8th, in Gerry Smyth’s bar in Limerick ’way back in 1980 when I heard that John Lennon had been shot dead. And no, this wasn’t comparable to that; of course it wasn’t. Still, it was pretty shocking just the same. I mean, a white collar crook was going to jail. A politician. A Senator. In Ireland. So: down went the irritating Ivor Callely, something that presumably brought a tear to the eyes of no one outside of his immediate family. Although in fairness it did make you wonder when you saw the relatively small amount that he’s been tucking away—embarrassing, when you think about it—compared to the likes of full-time chancer, tax avoider and Shannon Airport trespasser Mick Wallace– just back from strutting his stuff in South America for a month and no doubt overdue for another visit to the family vineyard for a chill-out session after his hard entire week at work. Well, as I say: no sympathy for Callely and nice to see one of them getting the bars slammed in his face for a change. Still, it’s a bit bemusing when you see them wheeling out Wee Willie O’Dea to give us a bit of the old Moral Outrage. You wouldn’t have thought that a sniveling perjurer had any High Ground on that, would you? But never mind Wee Willie Winkie and his bare-faced lies to the court only five years ago; he wasn’t happy with his old colleague at all, so he wasn’t. “This conduct is never acceptable”, thundered Wee Willie, mustache bristling in scarcely-concealed anger. “People who indulge in this conduct should be dealt with by the law. No wonder my jaw was bouncing off the ground. Was this the same misererable little goon who as Defense Minister had given an interview to the Limerick Leader journalist Mike Dwane concerning the raiding of a local brothel? You know, that time when he made claims connecting it with Maurice Quinlivan of Sinn Fein? And then denied everything, swearing out an affidavit and not giving a damn if the journalist involved lost his job? Of course, O’Dea ended up resigning when it turned out that Dwane had taped his remarks. I’ve mentioned before how amusing I find it that these fellas can’t seem to get their heads around new-fangled machinery like tape recorders. Do you recall Enda getting himself into a right old mess for something similar? 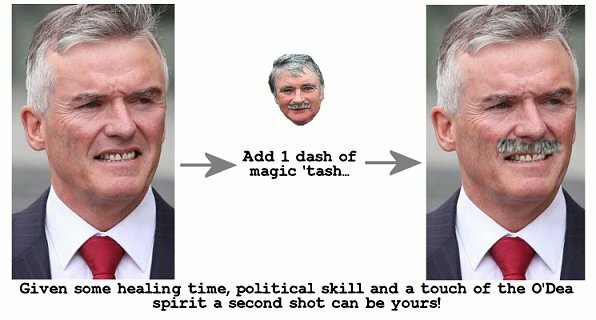 Anyway, like O’Dea the bould Callely used to be in Fianna Fail until a few years ago. Would he be returning to the fold after his slopping-out time (cough!) was over? Ooohhh, tricky one, thinks Willie. “I can’t envisage any circumstances in which he would ever be readmitted,” says he. Bloody Hell, Willie, that’s a bit harsh. I mean, if the FFers didn’t have a problem with a Minister like yourself who doesn’t mind lying under oath then I doubt that they’ll have much of a problem with an expenses fiddler. I really don’t.